Some of the short presentations at the East India Company At Home Project conference held in Edinburgh a few weeks ago are on History Spot. The speakers are Helen Clifford, Ellen Filor, Margot Finn and Kate Smith. That website has lots of other interesting history podcasts. There's a great series of walks, talks and events scheduled for the next week (and a half) throughout the Borders with the theme Myths and Legends - from Coldingham in the east to Ettrick and Eskdalemuir in the west and from Drumelzier in the north to Jedburgh and Hawick in the south. Ranging from Bats in Innerleithen to Burns (Rabbie) in Jedburgh, there will be something for everyone. Events are arranged by the Scottish Borders Council Ranger Service, the Haining, Borders Journeys, Historic Scotland, Borders Forest Trust, Friends of Coldingham Priory, Trimontium Trust, the Heritage Hub, Kelso Connections, Bowhill and more. We'd love to welcome you to an exhibition and book launch we're hosting on 19th September at 6pm. Catherine Maxwell Stuart and Margaret Fox have written a brilliant book on Traquair and the launch will celebrate this and provide an opportunity for the Border community to see some treasured items from the Traquair collections in the Exhibition Space at the Heritage Hub, Hawick. If you intend to come to this event please reply to Traquair House by email to: <enquiries@traquair.co.uk> or by phoning - 01 896 830 323 . This book by Catherine Maxwell Stuart and Margaret Fox not only tells the story of the Stuarts and the major political upheavals, their support for Catholicism, the problems they faced in the community because of that support and strained relations in the family; the family’s debts and fines and general Scottish history but also lots of interesting snippets of local interest. There are accounts of purchases made for clothing, wine and pans. Illnesses and medicines (including dragon’s blood !) are mentioned, there are letters home from the children of the 4th Earl of Traquair, who were being educated in Paris between 1714 and 1718; their support for the Jacobite cause, changes to the house and estate, correspondence about matters in America leading up to the Revolution and its aftermath, a mining enterprise in Spain and Portugal, Catholic emancipation in the 19th century, and the later Victorian developments. If there’s one drawback, it’s minor: on a few of the early documents, the caption doesn’t state the year. I found that very confusing and unhelpful; in some cases, I guessed the year by reading a few pages back but in other cases it was unclear. Although the documents themselves may not be dated, the authors evidently knew the year and it would have been so much easier to put the year in brackets in the caption. There are lots of illustrations - views, people, accounts and letters, buildings; nearly every page is illustrated and some pages have more than one picture. 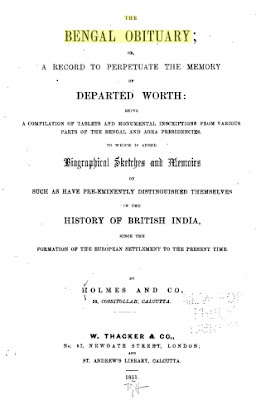 There’s an abbreviated family tree (with 13 of the 17 children born between 1695 and 1711 to Lady Mary Maxwell, wife of the 4th Earl) inside the front cover and a timeline of the principal events including accessions of monarchs inside the back cover. Its writing style makes it easy to read even for children. You can just read straight through, however the format is such that you can dip in and out. 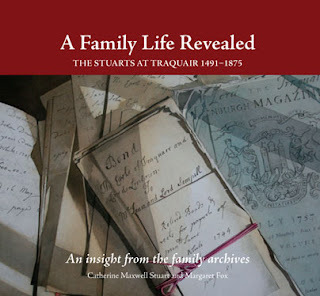 The authors have really made the documents in the archive come alive and tell the stories of the Stuart family at Traquair. Overall, it is an extraordinarily fascinating book and I wholeheartedly recommend it. 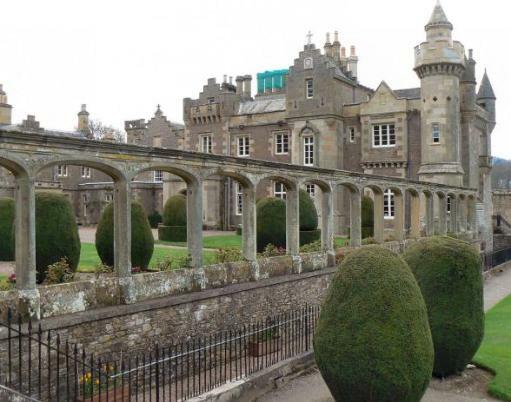 The book has 108 pages, the paperback version costs £11.99 and the hardback costs £14.99 and can be obtained from Traquair House or online at the Traquair House Shop. The authors will also be coming to talk to us at our meeting on Sunday 28th October in Innerleithen Parish Church Hall at 2.30pm and no doubt they’ll be bringing along copies of their book to sell and sign.